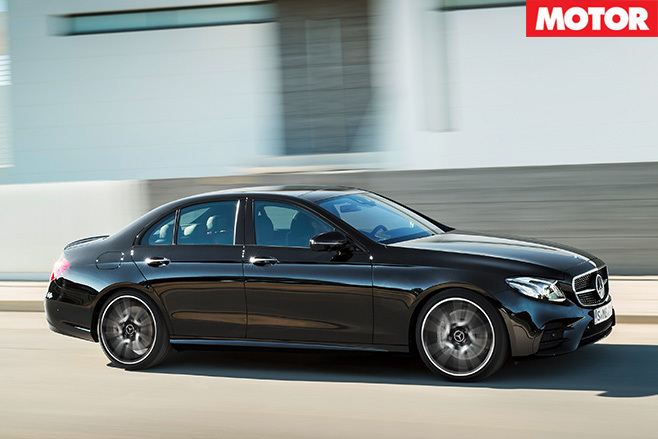 Pundits around the globe were shocked when Mercedes-AMG uncloaked its class-challenging, 450kW, 3.4sec 0-100km/h E63. Complete with an all-wheel drive system that can disable the front driveshaft to do skids until the back tyres burst like America’s sanity. It even trumped the Porsche Panamera Turbo and its 3.6sec sprint. There has been an LA-to-NYC-sized chasm in the E-Class range between the chrome-twinkling E400 and the all-guns-blazing AMG E63. Enter the Mercedes-AMG E43; although from the outset it appears as though it swings toward a conservative note rather than aggressive overtones. 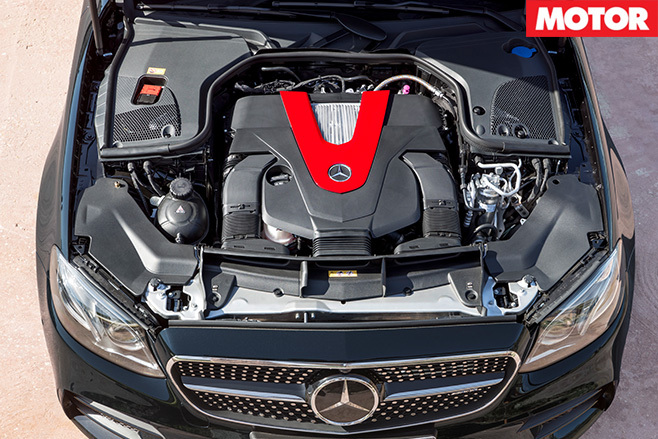 The E43 shares the basics of its 3.0-litre V6 engine with the E400, but with two, larger turbochargers deploying 1.1-bar boost and cylinder linings coated in friction-reducing Mercedes-F1-derived Nanoslide technology also used in the four-banger A45/CLA45/GLA45. It shifts from 245kW to 295kW at 6100rpm, and from 480Nm to 520Nm between 2500rpm and 5000rpm. The 1765kg, nine-speed auto-equipped E43 AMG gets a 4Matic system with 69 per cent of drive permanently directed to the 275mm-wide 19-inch rear rubber, together delivering a 4.6sec 0-100km/h. Some distance still exists to the 450kW/800Nm E63, but with a price of around $160K, the E43 will be far and away from big brother to the tune of $90K when it arrives by Christmas. The E43 also hits the rewind button by two decades – the 1997 E36 AMG cost $185K and ran an atmo six that achieved a 6.7sec sprint. It even returns to the days when AMG models limboed under the radar with more restrained styling than, say, a C63 Edition 1 in matte grey with orange stickers. 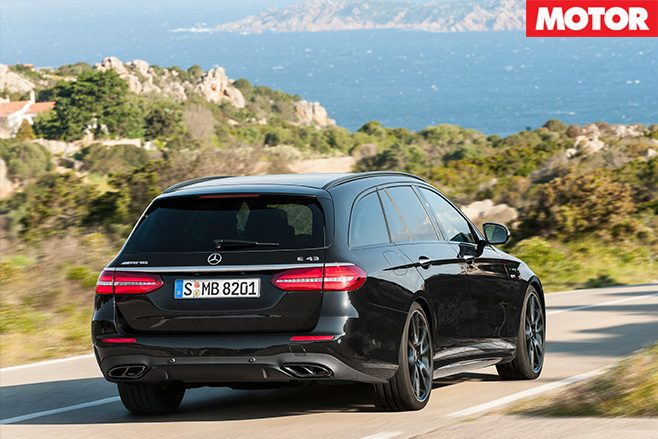 Beyond a flared front bumper, lip spoiler and quad exhaust pipes, this 4.9-metre-long AMG could be a Mercedes-Benz sedan by any other name – probably an E400 Sport. 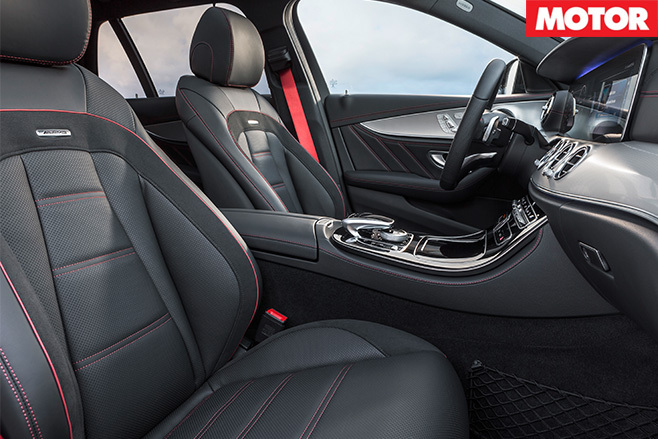 Inside, the leather seats are laced with red piping and an AMG-trademark Alcantara tiller, although the standard E-Class cabin with its S-Class-like design, IMAX screens and bevy of technology (adaptive cruise, self-driving, high-end audio) starts from a lofty standard. Fire the V6 engine up and an exhaust ‘whumpf’ immediately signals this E-Class’s Affalterbach training. With the hemmed-in refinement of a base Benz, however, little personality filters in on light and medium throttle from an engine that sounds generic. Thankfully the twin-turbo unit revs quickly and keenly towards its top-end, revealing clearer and crisper acoustics, and the auto will even permit each gear be slammed into the cut-out without auto-upshifting when in Sport+ manual mode. 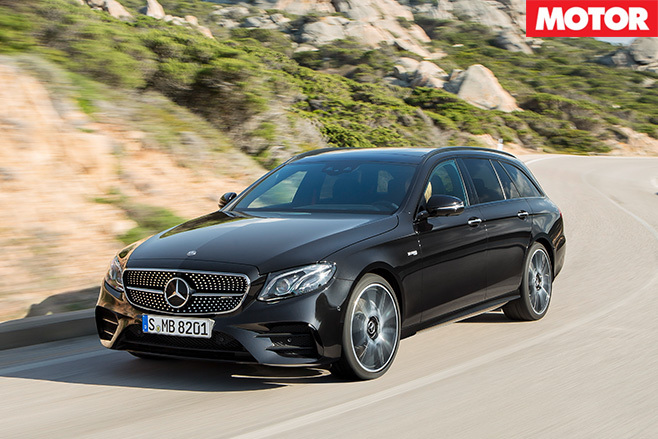 Nab a right paddle and burnt fuel crackles and fizzes through the exhaust and, finally, the E43 chars its ties with the E400. 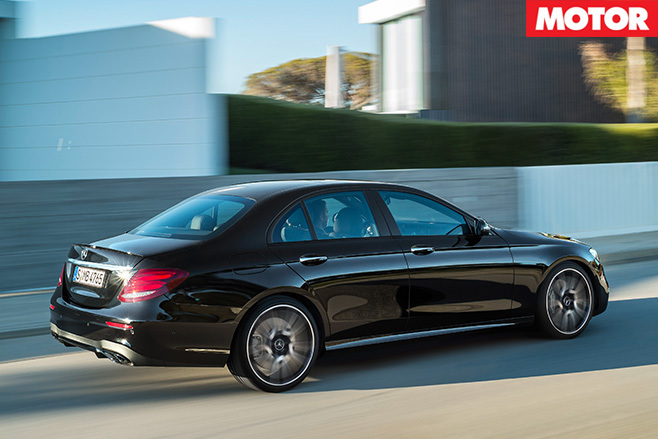 Curiously, though, the smaller C43 – which uses the same engine and mirrored outputs – gets a switchable sports exhaust, where the E43 uses a one-size-fits-all variety that makes the driver work hard for any theatre. Even left in Sport+ auto mode the transmission is superb, slinking into taller ratios when it detects calm cruising and immediately scaling octaves and thumping through ratios when a brutal bruising is requested via the throttle. Auto-tune is but one AMG-specific engineering change compared with other E-Classes, with special steering knuckles and load-bearing joints, increased negative camber on both axles, more rigid elastokinematics and a faster steering ratio working around a trio of unique Airmatic air suspension settings. Immediate and sharp response through the tiller is an instant highlight, as is ride quality that never falters – even on lumpy backgrounds around Stuttgart in firmest Sport+ the E43 maintains control and comfort, yet in actual Comfort mode it’s never soggy. The borderline dartiness of the front-end itself belies the 4.9-metre-long dimensions of this executive sedan, encouraging the driver to crack the throttle early in corners and indulge in the two-thirds-plus rear-drive bias. However, even in the stability control’s middle Sport Handling Mode, attempting to merely neutralise the E43 when the outside front rubber is loaded up can prove frustrating. Unlike the (smaller sized) Audi S4 with its crown centre differential, this AMG lacks the tight precision to pivot – let alone swing – between its front and rear axles.